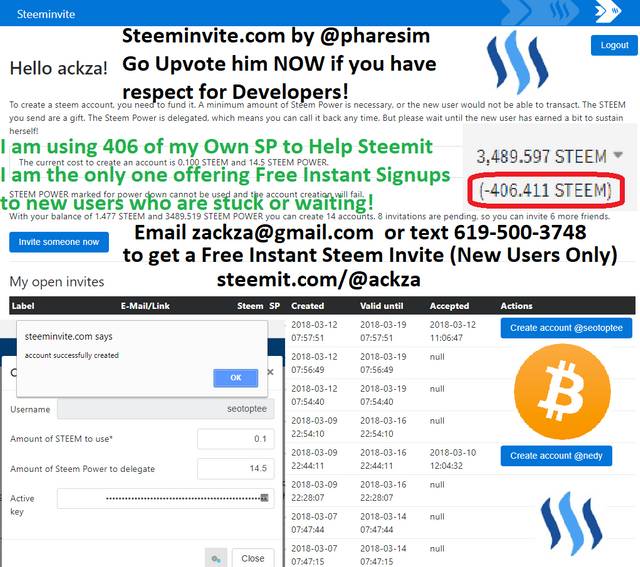 I am using over 406 of my own Steempower to help signup new users to steemit! All Glory to the Blockchain! I will be repaid by gaining followers and post rewards from posts like this! Email zackza@gmail.com or text 619-500-3748 for instant account! I am using now 408 Steempower given up to new users, 14.5-28.5 SP at a time to help create new steemians. This is all thanks to @pharesim and his amazing tool for instant account creation where I just pay 0.1 Steem and 14 to 28 steempower for one week for each instant account approval. On Reddit and other places people are complaining and begging for help getting signed up to steemit! This stat even shows how terrible the signup numbers have gotten! Look at these @penguinpablo numbers on new users created! It has gone from 8900 new accounts to just 448? What is going on? Account Creation seems broken but it may just be the re configuring of the new automatic/manual hybrid account approval system. So I hope I can help with my free account creation service where all I ask is the new user follows me and remembers to Upvote me if they ever buy Steempower or earn a good amount! Hey there @ackza, this is @mimie here (obviously 😂😂😂) and I am one of the people who got here solely due to your help. I had a genuine concern of having to wait for my account approval for days on end, and that was when a friend of mine: @yawgh mentioned your Free Instant Account Creation Service to me. I got him to send you my email, and Bam! I am here now. I'm very glad to be a part of this community now, and I so much hope that I am very much welcome. Thanks to you and @pharesim, steemit can reach some more people out there. This post has been upvoted with the lil power I have (after-all it belongs to you 😋😋) and resteemed as well, plus you deserve my follow, no doubt. I hope to see more of the good guys like you on here, and I hope to make your august acquaintance. @ackza you are a great philanthropist in the making. You will get double favour for your good works. This post has received a 6.75 % upvote from @booster thanks to: @fyrstikken. Thanks again for helping us get our account. We waited over a week and nothing happened from the main Steemit signup. Only about a day after contacting you, and our account was already up, with a free 0.1 Steem too! Big thanks to @ackza and his friends, and all glory to the blockchain! It creates difficulty to attract new users to come in! Awesome @ackza! keep up the good works!! Great initiative to help steemit gain more users which would potentialy be able to share amazing content with us. However, i do wonder how some people fail to get an account. As far as i know, most people who struggle with this are making a 2nd,3th or a 500th account. The simple fact that they use the same phone number, same e-mailadress or use the same IP adress to do this might get their signup request rejected. Are there cases where a completely new user, with an unused phone number, e-mailadress and IP adress would get rejected? I think not? If there is, i would love to know about that because that would indeed be a big problem which should be solved. If not, i don't think people should get help getting a 2nd or 500th account, if they really want to abuse the system let them do it by themselfs and don't help/support them. Correct me if i said anything wrong and thanks again for your good will and help! Oh yes its mostly all users with fresh emails and phone numbers. 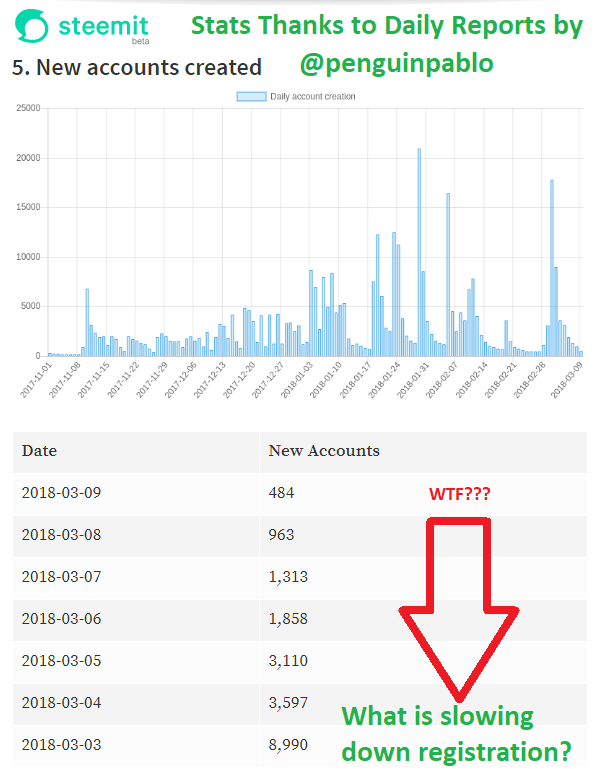 Experiencing this problem and yes I have seen some people trying to make their second account but most people have very little incentive to do this, and the evidence is all there in the @penguinpablo article @ackza posted after this, and in this "Daily Steem Stats" report you can see how the rates for new user registration drop from almost 9000 one day to around 400 a week later and then a day after that 21,000+ Accounts were al approved all at once! Appreciate with upvoted and Resteem. Here is my small upvote. Keep doing what you are doing. wow you are doing a good job. very good for new people. Plz vote, follow and comment on my post and blog. Thank you. This is a good idea for increasing new steemit member.